For larger items which absolutely have to stay dry, whether it's your map, first aid gear, important documents or sensitive electronics, the Aquapac Large Electronics Case can be relied upon to protect your kit. Large enough for tablets such as the iPad, BlackBerry PlayBook, Motorola Xoom and Samsung Galaxy Tab, the TPU material allows you to use the capacitive touchscreen while the device is in the case. High frequency welding and the easy-to-use Aquaclip closure ensures this case is dust, dirt, sand and waterproof, and when Aquapac say waterproof, they really mean waterproof! 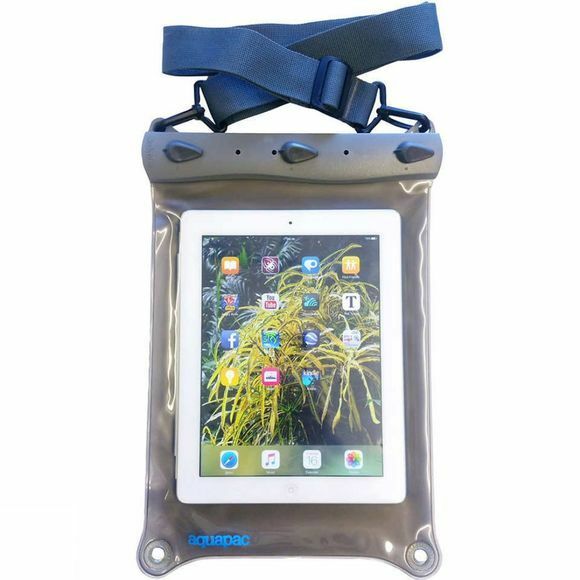 IPX8 rating means it can withstand at least 30 minutes of immersion in five metres of water (and Aquapac's in-house testing rates them as going even deeper): this is not simply a raincover. Please note: capacitive touchscreens don't work underwater, so although your device will be protected if you submerge it, you may have difficulty operating it.